Backflow prevention programs are required to protect safe drinking water. “Safe drinking water” is federally-mandated and regulated by the Environmental Protection Agency. Although millions of Americans receive high quality drinking water every day from their public water systems, drinking water safety cannot be taken for granted. There are a number of threats to drinking water: improperly disposed of chemicals; animal wastes; pesticides; human wastes; wastes injected deep underground; and naturally-occurring substances can all contaminate drinking water. Likewise, drinking water that is not properly treated or disinfected, or which travels through an improperly maintained distribution system, may also pose a health risk. At Twin Plumbing Poway, we’re experts at ensuring your backflow prevention system is operating to standard and that your drinking water is safe. The reverse flow of your water supply. Does backflow make my sewers back up? No, it is the reverse flow of your water supply or your drinking water. It is the prevention of water from flowing in reverse. Why does my backflow preventer need to be tested? It needs to be tested annually to make sure that it is working properly and not allowing potential pollutants or contaminants to flow back into the main water supply. Is my water safe to drink? 1. If your water comes from a municipality, your water is probably safe, but we would recommend a filtration system to remove some chemicals that are added to your water. This should improve the taste and odor of your water, as well as the appearance of your ice. 2. If your water comes from a private well, it probably is safe, but we highly recommend that the water be tested. Then, a water filtration system will be recommended. Again, this will improve the overall appearance, taste and odor of your water. If the annual certification of the backflow located at your water meter is due, please feel free to call our office to schedule the inspection of your backflow. Our fee for each certification vary by location and are per test. If you have any questions please contact one of our customer care representatives at (858) 518-0242. We appreciate your business! 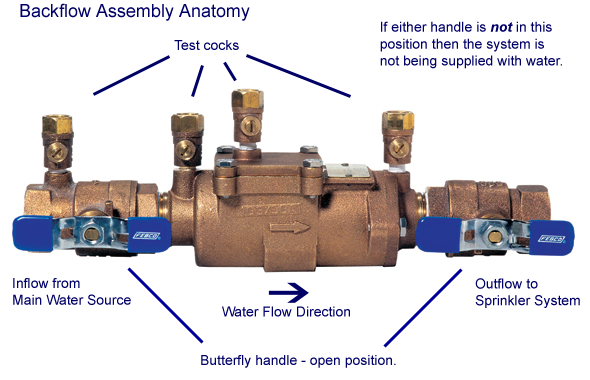 If we repair your backflow and replace internal parts, we offer a six (6) month warranty for these internal parts, should the device fail. When You Should Call a Plumber? Ricky was awesome. He took care of my problem and he even looked at my heating unit and explained what was wrong with it to me so that I would know what to say to the HVAC technician when he called. James is a great plumber and he has an outstanding personality. He does really good work and took the time to explain everything to me. I had …… plumbing company out here before, but from now on I will only use Twin Plumbing Poway. Your plumber was the most polite, professional and the most knowledgeable and experienced plumber that has ever been to my house! Thank you. James got here so quickly when my water heater started to leak. He replaced the water heater and made some recommendations to improve the flow of hot water to my kitchen. We are so glad he is our regular plumber. Your plumbers are very professional and courteous and your company always does what it says it will do. I will be recommending you to all of my neighbors. Thank you. Scott was wonderful. He went out of his way to be nice and to take care of all my problems. He was so conscientious and careful but he still worked very quickly and moved from one problem to the next very efficiently. I don’t usually call companies to give compliments but he really was very good. By the time he left, I felt like we were good friends. If I ever need plumbing work again, I will definitely call and ask you to send Scott again. Your plumbers were courteous and responded in record time, delivered outstanding service and most importantly, did not attempt to magnify the problem or quote outrageous prices. I am grateful that I was referred to Twin Plumbing Poway. Twin Plumbing Poway is a great company. Three different plumbers said they would come to my home. None of them did. I was without hot water for three days. I called Twin Plumbing Poway and they came within an hour. And they fixed my problem for far less than the other plumbing companies had said they would charge. I am recommending them to be put in my church directory of reliable contractors. Your plumbing company is great. I always call you (Twin Plumbing Poway) when I have problems with my home or rental properties. In fact, I’ve listed Twin Plumbing Poway in my Homeowners Association bulletin as the plumbing company to call for honest, reliable plumbers and good prices. Your plumber really took the time to dig in and find the problem that other plumbers couldn’t find. From now on, I’ll be using Twin Plumbing Poway for my home and for all my restaurants.